A Georgia Tech (Atlanta, GA) research team has developed a novel technology that enables ceramic molds to be fabricated directly from CAD data and it could change how industry designs and casts complex, costly metal parts according to its developer, Suman Das, a professor at the George W. Woodruff School of Mechanical Engineering. 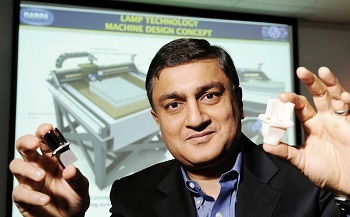 Suman Das, a professor at Georgia Tech’s School of Mechanical Engineering, displays a ceramic mold produced directly from digital designs using large area maskless photopolymerization (LAMP) technology. In his right hand, he holds a single-crystal superalloy turbine airfoil that was cast using a ceramic mold of the kind he holds in his left hand. 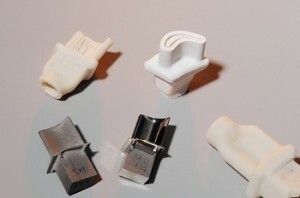 By contrast, Das’s approach involves a device that builds ceramic molds directly from a CAD design, completing the task much faster and producing far fewer unusable parts. Called Large Area Maskless Photopolymerization (LAMP), this high-resolution digital process accretes the mold layer by layer by projecting bitmaps of ultraviolet light onto a mixture of photosensitive resin and ceramic particles, and then selectively curing the mixture to a solid. The technique stacks one 100-micron layer on top of another until the structure is complete. After the mold is formed, the cured resin is removed through binder burnout and the remaining ceramic is sintered in a furnace. The result is a fully ceramic structure into which molten metal – such as nickel-based superalloys or titanium-based alloys – are poured, producing a highly accurate casting. “We’re confident that our approach can lower costs by at least 25 percent and reduce the number of unusable waste parts by more than 90 percent, while eliminating 100 percent of the tooling,” says Das. A prototype LAMP alpha machine is currently building six typical turbine-engine airfoil molds in six hours. Das predicts that a larger beta machine – currently being built at Georgia Tech and scheduled for installation at a PCC Airfoils (Beachwood, OH) facility in 2012 – will produce 100 molds at a time in about 24 hours. Although the current work focuses on turbine-engine airfoils, Das believes the LAMP technique will be effective in the production of many types of intricate metal parts. He envisions a scenario in which companies could send out part designs to digital foundries and receive test castings within a short time, much as integrated-circuit designers send CAD plans to chip foundries today. Moreover, he said, direct digital manufacturing enabled by LAMP should allow designers to create increasingly sophisticated pieces capable of achieving greater efficiency in jet engines and other systems. Das also notes that the new process not only creates testable prototypes but could also be used in the actual manufacturing process. That would allow more rapid production of complex metal parts, in both low and high volumes, at lower costs in a variety of industries. This could potentially impact applications employing advanced engineering plastics.